For their new 7” vinyl single, Portland based indie-folk band Horse Feathers combined their instrumental prowess and laid back aesthetics to cover “Drain You” off of Nirvana’s groundbreaking Nevermind album. 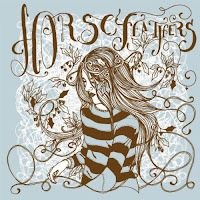 Swapping out the distorted electrics and pounding drums for acoustic guitar, strings and banjo, Horse Feathers manage to restrain the intensity of the original, while still perfectly capturing the raw and unsettled mood Nirvana was so great at creating. The end result has a cool ballad feel with an agitated undercurrent that ends with a flurry of sawing strings and banjo strums. It’s easily one of the most engaging and imaginative Nirvana covers I’ve ever heard. The single is backed with “Bonnet of Briars,” an upbeat folk song led by their signature banjo and string sounds. Horse Feathers just released a full length album, Thistled Spring, in April of this year, so it’s great to already see two new tracks of such quality and originality. The art work on the single is gorgeous too. The “Drain You” 7” single will be released on Kill Rock Stars on November 2nd. Physical orders can placed HERE.